Y3d region has well resolved spin-orbit components. When multiple chemical states are present, apparent resolution of these two spin-orbit components is reduced. Found in solid oxide fuel cell materials. 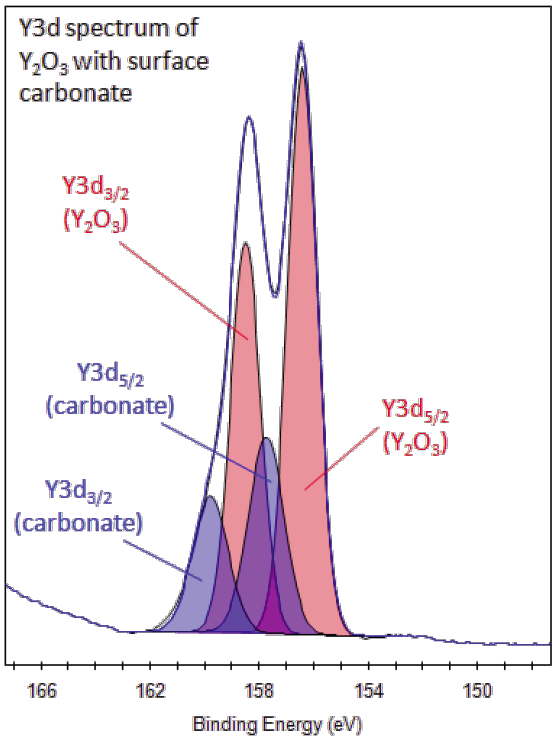 Y2O3 adsorbs CO2 from atmosphere to form carbonate species. Although it is never found unbound in nature, yttrium is commonly found in rare-earth metals. Yttrium is chemically similar to lanthanides and relatively stable in air. Yttrium compounds give color television its red color. Ytterby, a Swedish village, is located near a quarry that contained minerals comprised of rare earth elements and other elements. This village gave way to the name of this and three other elements. 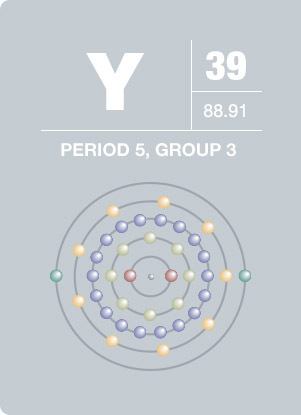 Samples of lunar rocks from the Apollo program yielded a relatively high content of yttrium. Yttrium has no known biological role and is not normally found in human tissue.